Not just for students - anyone can book! This was a great way to overnight in Sheffield on a budget. The breakfast was very generous and tasty. The room was basic but clean and tidy. Excellent internet access. Close to shops in Broomhill. If you are going to use the kitchen, you need to bring your own utensils. The University accommodation varies in standard but we have provided as many photographs as possible to help you chose what suits you best. We believe it does generally meet a level of comfort that we expect most visitors to be happy with. We will welcome any feedback where this is not the case. The University does allow young children and parents to bring travel cots, although regrets it is unable to provide such facilities itself. Rooms are mainly available during the two main academic vacations, although some rooms are now available all year round. Sheffield is one of the most exciting cities to emerge from the rapidly regenerating North of England, having undergone a major regeneration over the last five years. Sheffield has two major theatres, the Lyceum Theatre and the Crucible Theatre, which together with the smaller Studio Theatre make up the largest theatre complex outside London. There are four major art galleries, including the modern Millennium Galleries and the Site Gallery. The Sheffield Arena is located in the Don Valley area just outside the city centre and it is one of the major arenas in the UK hosting big music acts of the world. 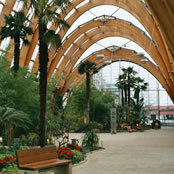 The city also has a number of other attractions such as the Sheffield Winter Gardens and the Peace Gardens, the Botanical gardens (just five minutes walk from the university accommodation), Ice Sheffield, the Ponds Forge International Sports Centre, as well as several museums, including the Weston Park Museum, the Kelham Island Museum, the Sheffield Fire and Police Museum, Abbeydale Industrial Hamlet and Shepherd Wheel. Sheffield also has many large parks such as Millhouses Park, Endcliffe Park, and Graves Park. The films The Full Monty, Threads, Looks and Smiles, When Saturday Comes and Whatever Happened to Harold Smith? were based in the city. Located just 5 miles from the southern end of the Pennine hills in the Peak district and offering easy access to many attractions located within the Peak District - the UK's first National Park. A visit to Bakewell and the spa town of Buxton is a definite on your list of places to visit. By Road: Central to the motorway network Sheffield has excellent access to and from the M1, M18, M62 and A1. For further information on travelling by rail in the UK visit www.nationalrail.co.uk. Sheffield, which is in South Yorkshire, is the fourth largest city in England and is so named because of its origins in a field on the River Sheaf that runs through the city. The area that is now the City of Sheffield has been occupied since at least the last ice age, but the settlements that grew to form Sheffield date from the second half of the 1st millennium, and are of Anglo-Saxon and Danish origin. After the Norman conquest, Sheffield Castle was built to protect the local settlements, and a small town developed that is the nucleus of the modern city. By 1296 a market had been established at what is now known as Castle Square, and Sheffield subsequently grew into a small market town. In the 14th century Sheffield was already noted for the production of knives, as mentioned in Geoffrey Chaucer's The Canterbury Tales, and by 1600 it had become the main centre of cutlery production in England, overseen by The Company of Cutlers in Hallamshire. From 1570 to 1584 Mary, Queen of Scots was held as a prisoner in Sheffield Castle and Sheffield Manor. 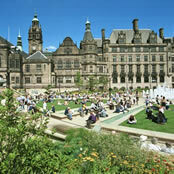 The University of Sheffield is a leading research university, located in Sheffield in South Yorkshire, England. It is ranked within the World's top 100 Universities and constantly ranked amongst the top 20 universities in Britain. Notable alumni include: Nicholas Liverpool, the current President of Dominica, pioneering English pilot Amy Johnson, film director Stephen Daldry and David Blunkett Member of Parliament and former Home Secretary.